Like most people, I have a deep affinity for cover songs. 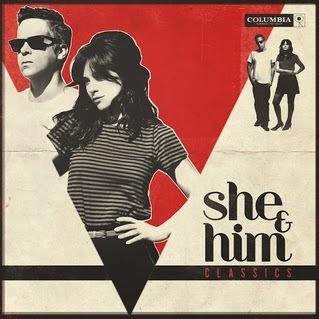 I also have a soft spot for She & Him. So what can go wrong when the two meet for the new album Classics? Well, first off, the duo of M Ward and Zooey Deschanel go a little too far in their Way-Back Machine to grab the source material for this one. Much of the appeal of cover songs is to hear how an artist puts their own spin on the original. If the listener isn't familiar with the original, it eliminates that element. That's certainly the case for me with Classics. The second issue is with the arrangements themselves. Many of the tracks are simply too pedestrian to be interesting. That's the main problem with songs like "Stay Awhile", "This Girl's In Love With You? ", "It's Always You", and "I'll Never Be Free" among others. Some of the other arrangements are just slightly odd. The horns on "Oh No, Not My Baby" give it a vibe that could've placed it on the soundtrack to the Mary Tyler Moore Show back in the day. "It's Not For Me To Say" is the strange combination of half Christmas carol, half Bond theme. While they enlist the help of the Chapin Sisters for "Unchained Melody", the pace is so glacial that it should come with a warning about operating heavy machinery. The cutesy in Deschanel's vocals must be wearing off, because her notable moments are few and far between. She croons a nice one on "Stars Fell On Alabama" and she and Ward swap the brighter "Time After Time". It's Ward though that stands out when he sings. He has a gruffer delivery on this record, highlighted by his fronting "She". "We'll Meet Again" is the perfect closer to almost any album, and it's true here as well. It's nearly impossible to mess that one up. As much as I love the dynamic between Ward and Deschanel and the intimacy that they create, I find it really difficult to see why this album exists rather than waiting until they had a record of new material to release. Best tracks: "She", "We'll Meet Again"